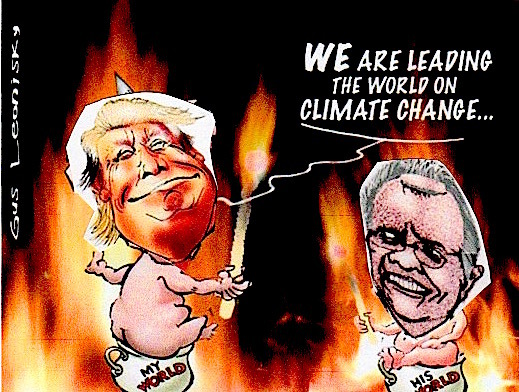 Due to an unstable roster of ministers, Australia's climate and energy policy has been suffering, writes Giles Parkinson. HERE ARE TWO QUESTIONS that go to the state of Australia’s policy-making and the health of its democracy. They are particularly relevant as we watch, in horror, the course that climate and energy policy is taking in this country. Australia’s policy-making is dominated – as we suspected – by the visible, but mostly invisible hand of vested interests and lobbyists. The extent of this is revealed by a new report from the Grattan Institute — 'Who’s in the room? Access and influence in Australian politics'. The report reveals that access and influence are heavily skewed towards the businesses and unions that have the most to gain (and lose) from public policy and how vulnerable it is to regulatory capture. And here is where we get the two Orwellian responses to two crucial questions highlighted by Kate Griffiths, one of the co-authors of the report. Q1: What is the penalty if you are caught lobbying on behalf of a company and/or industry, without being registered as a lobbyist? Answer: De-registration. The penalty for acting as a lobbyist without registration is to lose the registration that you didn’t have. Q2: What is the penalty if you are a former government minister who has left parliament and you are discovered lobbying in the area of your former portfolio? Answer: The penalty for a former minister acting as a lobbyist in his former portfolio is the loss of the ministerial duties you no longer have. The rain bucketed down in western Sydney last night, with more than a month's worth falling in just an hour. The Bureau of Meteorology (BOM) recorded 70 millimetres in Penrith from about 7.00pm onwards. The average October rainfall for Penrith is 51mm. The downpour resulted in flash flooding in the area, and one person needed to be rescued from a car stuck in floodwaters. Australia would need to shut 12 of its coal power stations by 2030 in order to do what the Intergovernmental Panel on Climate Change (IPCC) says is necessary to avoid catastrophic effects of climate change. The Government says coal will "continue to play a vital role in our energy mix, now and into the future"
To stop warming at 1.5C, the United Nations' IPCC said this week coal use for electricity must be reduced to almost zero by 2050. To figure out Australia's share, the library researchers looked at how much electricity was produced from coal across the country in 2010 and simply cut it by 78 per cent. scummo should listen good... or be thrown out. Trump Team Pushes Fossil Fuels at Climate Talks. Protests Erupt, but Allies Emerge, Too. Trump administration officials at high-stakes climate talks in Poland offered a defense of fossil fuels, arguing that a rapid retreat was unrealistic. While that stance brought scorn from environmentalists, it is finding an audience among other major fossil-fuel producers, including Russia, Saudi Arabia and Australia.